What Did You Eat Yesterday? Vol. 13 Review – AiPT! A slice-of-life tale with delicious-looking food. In the world of food manga, there are all sorts of different sub-genres. Some series, such as Food Wars! : Shokugeki no Soma, are shonen adventures. Others, like Giant Spider & Me, incorporate post-apocalyptic and sci-fi elements. 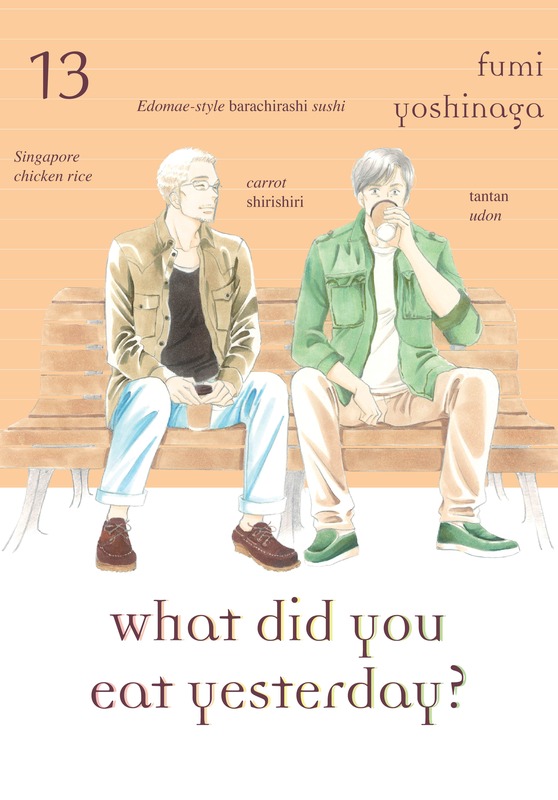 There are also some, like Fumi Yoshinaga’s What Did You Eat Yesterday?, that are purely slice-of-life. The series’s thirteenth volume, published by Vertical Inc., just came out this week. It collects chapters 97-104 of the series, which detail the latest developments in protagonists (and lovers) Shiro and Kenji’s personal lives. It also, of course, features a hell of a lot of cooking. Is this volume good? In terms of its characters, What Did You Eat Yesterday? impresses. Shiro and Kenji are likable characters who spend their days cooking, bantering, and helping each other cope with aging. Their antics are frequently amusing, and Yoshinaga does a good job capturing the sort of compassionate and humor-filled rapport common to many older couples. We also get glimpses of their work lives, and these help make their world feel more fleshed out. With that said, the most compelling portions of the story are those devoted to the characters’ experiences growing older. In the latter half of the volume, Shiro learns of an old acquaintance’s death and then attends the wake. Hearing other people his age (he’s in his early fifties) talk about grandchildren and dying of disease as opposed to in accidents makes Shiro conscious of just how much he’s aged. There are some nice insights here about how one’s mental sense of their age can sometimes stall after 35, as well as how to reframe birthdays in a way that doesn’t just feel like marching toward death. The cooking scenes in this manga are also enjoyable. Shiro always makes multiple elaborate dishes at a time, listing off tons of ingredients that make the reader’s mouth water. The artwork in these scenes is the volume’s best, as Yoshinaga perfectly depicts specific details such as how broth looks when it’s boiling in a pan. The food looks just plain delicious, thanks to the intricate level of detail in both the line-work and the recipes themselves. It would be difficult not to get hungry reading this volume, given that Shiro whips up such good-looking food while also explaining how different flavors mingle together. Nonetheless, the cooking scenes do have some cons. The most notable of these is their length. Now, an abundance of cooking is obviously going to be present in any cooking manga, but What Did You Eat Yesterday? has so much that there’s barely any page-time left for actual plot or character development. As a result, one can easily reach the end of the volume without feeling like they’ve seen much transpire or change. The characters’ dialogue when describing food also feels a bit clumsy yet mechanical at times. It’s almost as if Yoshinaga is trying to work his way through checklists of talking points. Unfortunately, these points aren’t always woven into conversations in ways that feel natural. My other main con with this volume is that the art is a bit inconsistent. In some cases, especially during cooking scenes, it is pleasing to look at and even mouth-watering. The characters are also well-rendered throughout, although the styles used vary considerably. The panels in which Yoshinaga depicts Shiro and Kenji with a higher level of detail are the most impressive, as they capture the characters’ expressions and reactions well. The more humorous segments, however, tend to utilize a more simplified style that isn’t as charming. The art in these panels doesn’t look bad, but it’s fairly generic. Overall, What Did You Eat Yesterday? Vol. 13 is a charming book with likable characters and delicious-looking food. The volume is relatively light on actual plot developments, but those present provide solid insights about the protagonists. On the downside, some of the dialogue is a bit clumsily written and the artwork is a bit generic at times. Nonetheless, this is a solid read that’s worth your time if you enjoy slice-of-life stories. Though light on plot and character development, this volume entertains with its likable protagonists and delicious-looking food.